Fashion fans were treated to a taste of environmental activism from two of the UK's most iconic designers last weekend in the first of what could be many ‘Urban Outdoors' festivals. 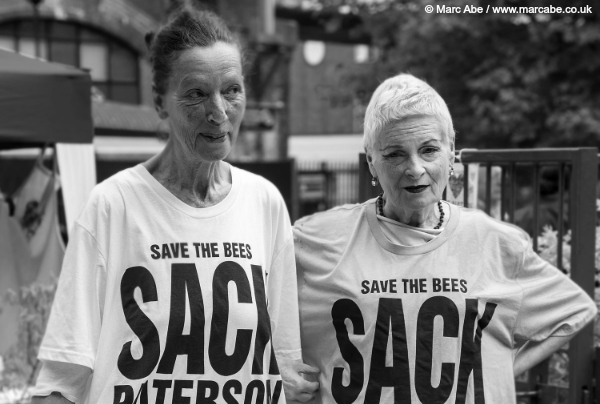 At the Urban Outdoors festivals, held at Castlehaven Community Centre, Camden, fashion royalty Dame Vivienne Westwood and Katharine Hamnett joined forces to promote valuable environmental messages to the London community, encouraging locals to oppose fracking, fight against pesticide use and begin living more sustainably. EJF's volunteers were selling our bee-themed designer t-shirts, doing bee-themed face painting for children and talking to festival goers about how they could help to SAVE THE BEES by growing flowers and plants for bee habitat, building bee hotels and not using any chemical treatments in their gardens.